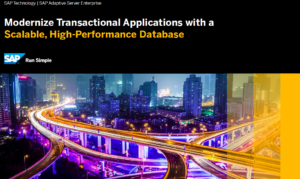 SAP Adaptive Server Enterprise 16.0 SP03 is now available for SAP Business Suite and other SAP Applications. This release brings you an In-Memory Row-Store, a new Secure Store, MVCC, 3-note High Availability + DR and much more. More info.